FIG. 2-5 -This GLEN-L BUCKBOARD uses a simple LATEEN RIG. The sail has a sewn-n sock along the luff at the clew to attach it to the tubular aluminum spars. 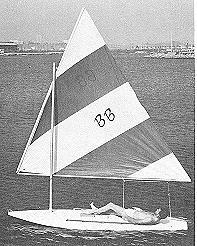 No battens are used in the sail. This mast is also free-standing.